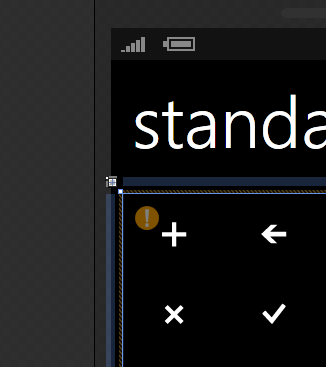 I created a new Windows Phone Application project and found some of the standard application bar icons on my disk (here on my PC C:Program FilesMicrosoft SDKsWindows Phonev7.0Iconsdark). I added a reference to Microsoft.Phone.Controls.Toolkit and added a WrapPanel to the Content grid on my page. I dragged all of the icons in, tidies up the layout to give this. 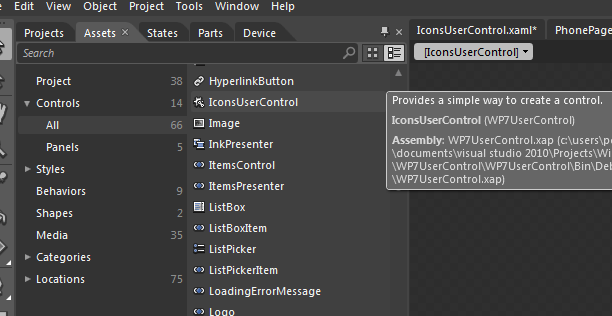 Now in Blend I right-click my WrapPanel and select ‘Make into UserControl…’ and Blend will create the files for me and reference the new UserControl on the page I created it from. Now, if I make any edits to anything on my user control and flip back to a page that references it Blend will provide a visual cue that something has changed and I need to recompile to have the change propagated. It looks like this with an exclamation! So, from there I dragged my usercontrol out onto my second page.